Specimens in herbaria include “pickled” plants in pots (shown here), dried specimens and fruits or seeds preserved whole. 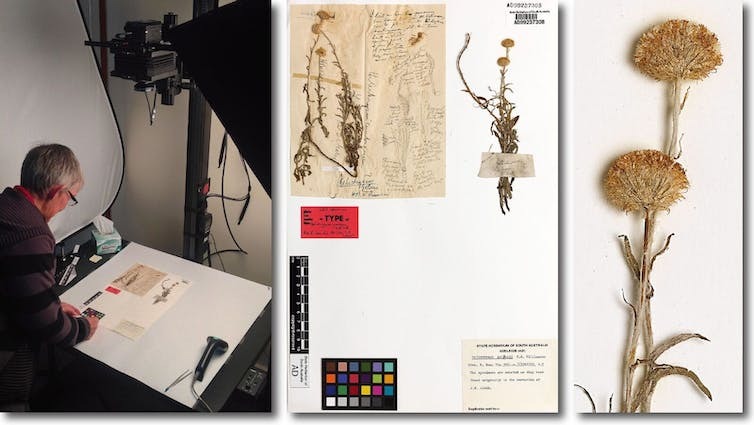 Although unfortunate, the incident has focused attention on the importance of being able to share scientific specimens around the world, and the vital role that herbaria play in modern science. Despite being sometimes described as “museums for plants”, herbaria aren’t just natural history storage and displays. In this era of DNA barcoding, big data, biosecurity threats, bio-prospecting, and global information sharing, herbaria are complex and evolving institutions. If you tell someone that you work at a herbarium, most will ask “what’s that?”, or perhaps “oh, what kind of herbs do you grow there?”. Herbaria house historically important plant specimens with precise details of their collection. The card on this 247 year old example reads: Viitadinia scacbra, DC. Australia: Queensland. Bustard Bay 24°05’S 151°28’E. 23 May 1770. Collected by Joseph Banks and Daniel Solander, Captain Cook’s first voyage 1768-1771. 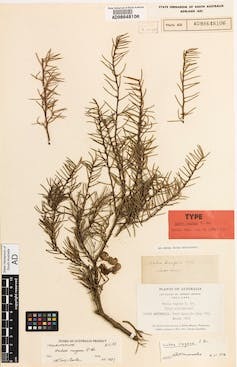 Conventionally, a herbarium is a collection of preserved plant specimens that are stored and managed in an organised and structured way by curators and botanists who specialise in plant taxonomy and systematics. There are some 3,000 active herbaria worldwide. As a collective, they contain more than 380 million specimens, spanning collections dating back as far as 500 years ago. The State Herbarium of South Australia, Adelaide. 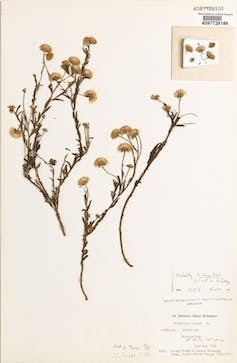 Herbarium specimens exist in many forms, including “pickled” plants or plant parts such as flowers or other delicate structures, dried specimens still attached to the surface on which they grew (like tree bark and rocks), and fruits or seeds preserved whole. But the overwhelming majority are dried, pressed plant specimens attached to archival card. Alongside these specimens there are sometimes drawings, paintings or photographs of the species, which capture details that are not discernible in the preserved specimen. The plant specimens don’t just exist on their own inside herbaria. Along with the specimens, the accompanying information is vital, such as where and when they were collected, specific details of the environments where they were collected, and who collected them. In Australia, the major herbaria have been actively adding this information into a digital repository, resulting in a world-leading dataset: the Australasian Virtual Herbarium. Sites of collection of Australian and New Zealand herbarium samples of the weed ‘Salvation Jane’ as displayed on the Australian Virtual Herbarium website. The collation of these resources helped to inspire the development of the Atlas of Living Australia, and gives anyone with an internet connection access to specimen records from around Australia and the world. Specimen-based, online data sets provide evidence of what species are found in a particular place at a particular time. They are a direct link from the presence of a species in the field, to collections of physical specimens held in herbaria, with the current name (that is, the latest changes in taxonomy) for that specimen. There are many applications of such evidence including tracking changing species distributions such as ferals and weeds (an example of the weed “Salvation Jane” is shown in the figure above). Herbaria have been active in supporting detection of biosecurity threats. New introductions of species to Australia need careful determination of their identity and herbaria work with agencies to assist with this. 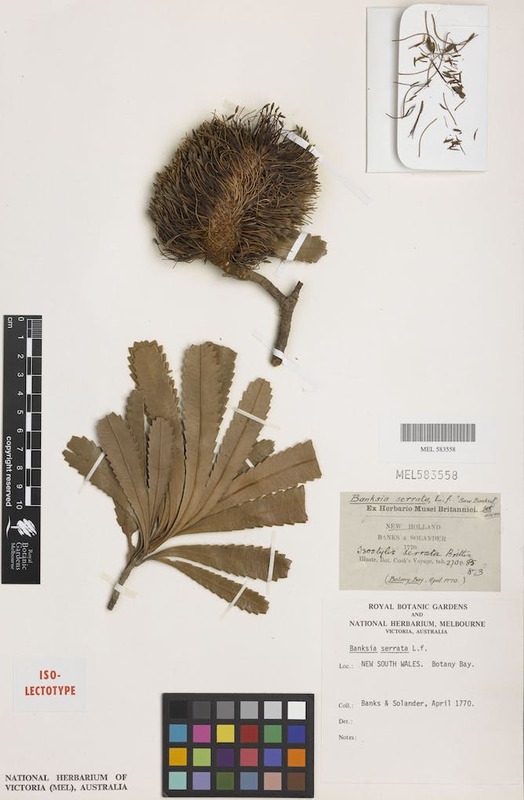 Sometimes, herbarium or museum specimens are the only evidence that a species existed at all. For example Gentianella clelandii, a species of native Gentian, is only known from the collection made of it in 1947 in the South East of South Australia. This species and others like it are likely to have been lost as a result of changing land use in the region at this time. Australia’s banksia is a well loved plant. This specimen card reads: Banksia serrata L/F New Holland, Banks and Solander, Botany Bay, April 1770. Important historical, scientific or cultural plant specimens exist in herbarium collections. 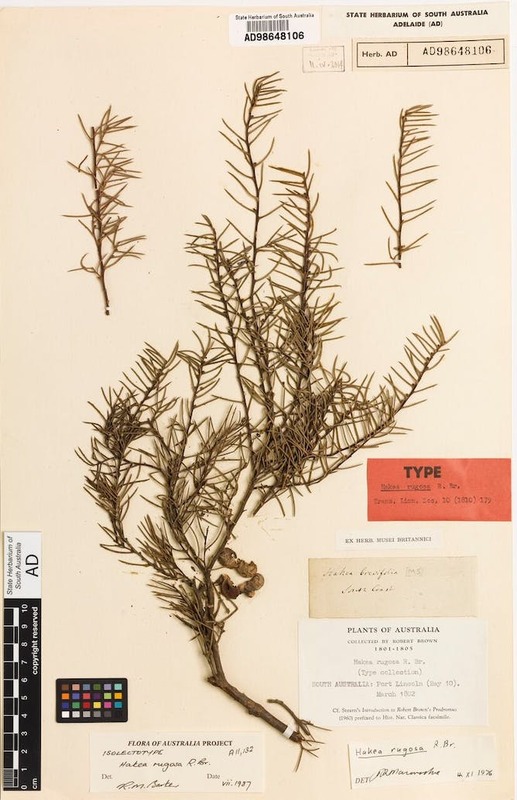 Plants collected during the voyages of early European explorers – including Dampier, Cook, Flinders and Baudin – are still found in herbaria. Some of these plants were also shipped live back to Europe, and have been grown in gardens and in scientific collections all over the world. Remarkably, due to the care in methods of preserving them, these specimens are often in excellent condition more than 200 years after their collection and still able to be used productively in scientific research. Type specimen collected by Robert Brown, who circumnavigated Australia with Matthew Flinders. The card reads: Hakea rugosa R. Br. South Australia: Port Lincoln (Bay 10) March 1802. These historical specimens are often the first known collections of a previously undescribed species. If so, they will be designated as “type” specimens by the taxonomist naming the new species. Type specimens are very important as they allow the work of taxonomists to have a global frame of reference. This allows scientists to work out if two (or more) species have been assigned the same name. 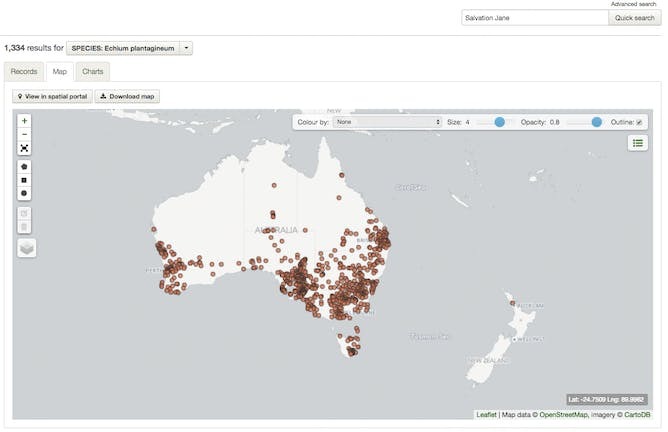 Herbarium records enable resource managers to track distributions of both pest plants and endangered plants, providing a historical and current view of how widely spread and common the various species are across Australia. Taxonomy is the science of describing, classifying and naming plants, animals and microorganisms of the world. Taxonomists do the work of describing and arranging plant species into classifications based on their morphology (what they look like), their genes and sometimes other features. While highly scientific by nature, taxonomy is also vital to society at large. For invasive plant control, for border control, for environmental management and for urban planning, there must be no ambiguity as to which plant species we are talking about. Common names of plants can be misleading, the same plant often having many different common names. For example, the Australian iconic tree species Eucalyptus camaldulensis is known as River Red Gum, Blue Gum, Murray Red Gum, Red Gum, River Gum and Yarrow. We know these are all the same species, because taxonomists can compare herbarium specimens and determine if they share the same characteristics. Expansion of the search for new biological compounds for human use — including medicines, food, cosmetics and other applications — exemplifies the problem of misapplied taxonomic names. For example the search for bioactive compounds in marine algae yields very different results for different species. But imagine if there wasn’t a way to apply the precision of taxonomy in the search for information on the characteristics of a species to be used for biological control? Not only would time and money be lost, but the incorrect species could be used and unforseen outcomes may occur. An example from the insect world is the Southeast Asian termite. A potentially harmful species of the termite genus Coptotermes was known regionally by another name, affecting its management as a pest causing building damage in the Americas and Malaysia. In addition to storing and organising specimens, larger or highly specialised herbaria usually have an associated research program. Focus scientific areas typically include taxonomy, systematics (how living things are classified and named), evolutionary biology, conservation biology and applied botany (using plants for economic benefit) . Many herbaria have molecular genetics laboratories attached to them. DNA can be extracted from many specimens, even very old ones, and thus they can become a core part of ongoing DNA based scientific research. Today, DNA barcoding can provide a rapid tool for identifying species when flowers or fruits are not available, or if we have only fragments. Globally, DNA barcodes are now available for more than 265,448 species in the BOLD database. This aggregation of DNA sequences, which for plants are linked to herbarium vouchers, are a global resource that can be used in a “big data” context to explore ideas. The value of herbaria samples extends beyond just the plants themselves. Herbarium specimens have been used to collate data for inferring changes in flowering times, leaf morphology and species ranges with climatic shifts. Scientists also analyse chemicals that herbarium specimens have been exposed to, such as heavy metals associated with urban development, and different elements incorporated as leaves grow. Knowledge about waxes on leaf surfaces, as well as inhabitation by insects, fungi and bacteria are all possible through herbarium samples. The global network of herbaria share specimens so that taxonomists and other researchers can benefit from their existence. With online resources making it known exactly what specimens are in which herbarium, there is an ever growing set of demands made on the use of specimens. Curators who look after collections must balance the requests for using specimens in the present with long term preservation. The ability to track the impact of climate change and other unforeseen influences on plant health may make our current herbaria collections even more priceless in years to come.